We took our form from Maya and used a waffle script in Rhino, using Grasshopper, to output our form in a 2 dimensional formate to be lazer cut. Generate a number of equally spaced, horizontally aligned curve frames. Horizontal Frames is a tool that can, given any selected curve or curves, produce a given amount of horizontal planes that are equa-distance from each other. The tool equally redivides the curve as many times as designated and at every point it provides a horizontal plane. This would probably be helpful when designating levels to work with or when you have a varied amount of heights for your work plane. 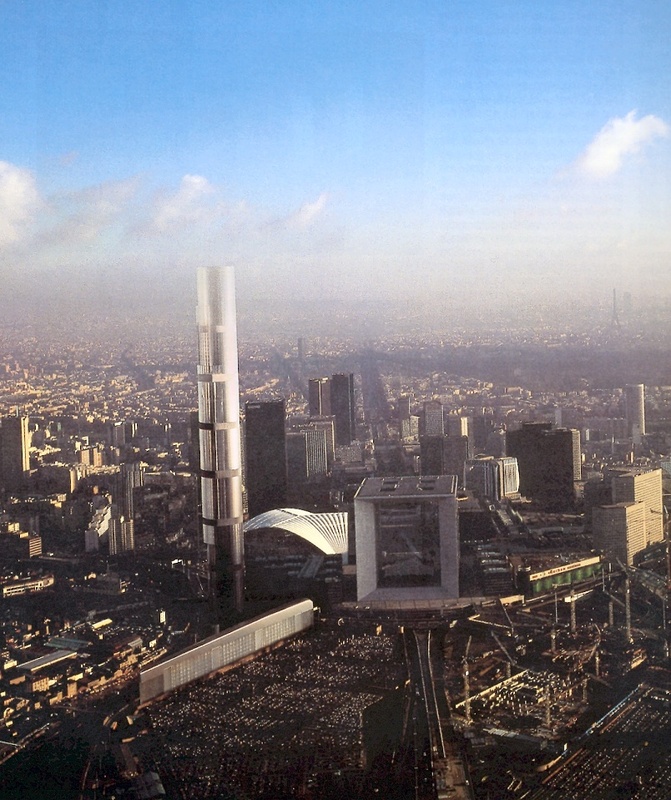 La Tour Sans Fin was a project that was proposed by Jean Nouvel for Paris. The site was to be La Defense, which is the commercial district of Paris aka ‘the little New York of Paris’. Paris suffers from an immensely dense population primarily due to the height limitations imposed on the city that have kept with the ‘Haussmann’s Paris’ tradition of being strictly limited to roughly 20m with exception to monuments. The only tower in the heart of the city is La Tour Montparnasse which is 210m. Due to the fact that Paris is holding on desperately it’s identity and culture, very little is being done to allow for towers to be built in the city. La Defense is technically outside of the city, but even then, none of the skyscrapers in existence surpass La Tour Eiffel which is 300m. With a population of 2,000,000 in the heart of the city and the total reaching 12,000,000 once you count the suburbs, the city is at saturation with 55,000 people per square mile and La Defense having a population of 20,000 for 5 square miles, it has another 180,000 people coming to work daily in 35 million square feet of office space. 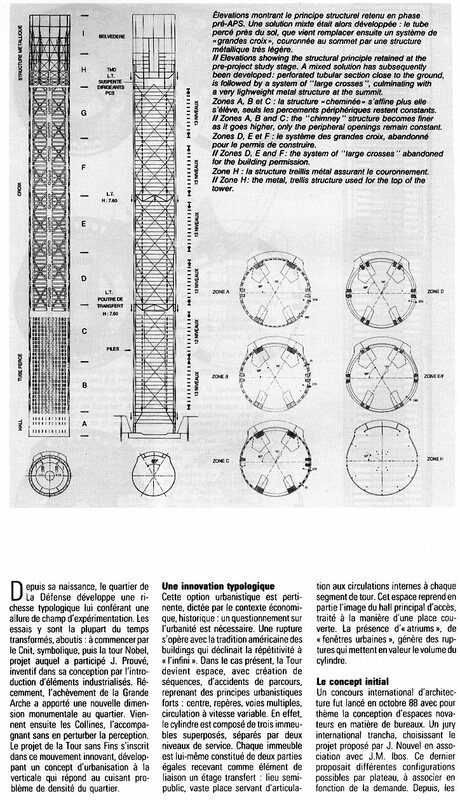 La Tour Sans Fin was a proposal to construct a 425m tour that would be the answer to these conflicting issues. The tower would have come up from an abyss of dark granite so that the beginning of the tower would be indistinguishable (25m into the ground) and as it rose the structure as well as the building envelope would dissolve into seemingly nothing (glass) as to not appear to be as tall as it was and at the same time to conceptually allude to a limitless edifice. So, even though the project was never realized, this design could be solved through a parametric solution that would drive the dissolving building envelope and structure, which had caused problems in the past. This project would have been a step forward in aiding the city of Paris with it’s density issues, and more importantly the response would have respected the cities cultural identity while also being a social solution. Lastly the solution is an elegant response to meeting the ground and meeting the sky in a way that, visually the perception of the tower would have been a vertical that blends into the ground and sky. The project has an outstanding ability to blend in.